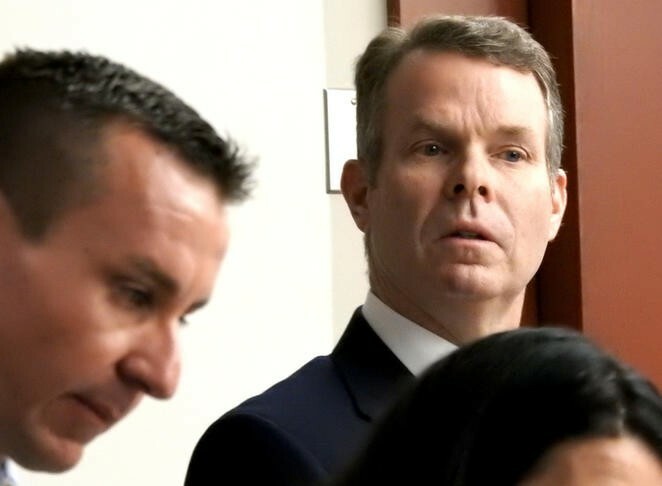 Day 2 of the eagerly awaited John Swallow trial brought both more of the same and some startling new information on Thursday. 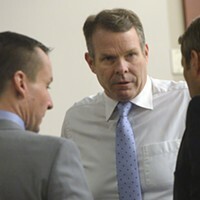 In the morning, the Salt Lake County district attorney's star witness, former developer, fraudster and felon Marc Jenson trotted out a tame version of events regarding what happened at the second of two trips former AG Mark Shurtleff and Swallow made to a California luxury resort, where they enjoyed themselves on Jenson's dime. Tame in the sense that it lacked some of the lurid drama of his prior broadcasting of allegations in court that Speaker of the House Greg Hughes and former Nevada Sen. Harry Reid were briefly present at the exclusive Pelican Hills resort, attending a secret meeting dedicated to fleecing taxpayers of $35 million. 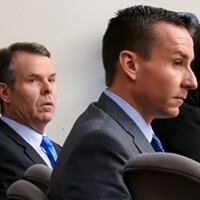 Both men have denied any connection to Pelican Hills or the conspiracy the DA has outlined, alleging that Shurtleff, Swallow and political operative and Shurtleff confidante Tim Lawson put the squeeze on Jensen for years. 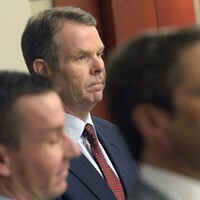 In language Swallow's attorney Scott Williams would later describe in court as “very flowery explanations of things,” Jenson said he paid for everything at Pelican Hill, ranging from $1,000-a-night rooms and $228 massages for Swallow’s wife, to $12 hot dogs and bratwursts and a $98 Argyll sweater. Prosecutors showed multiple receipts with what Jenson said was Swallow's and his signature. 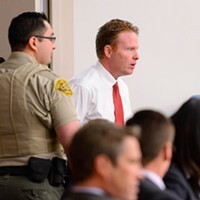 Prosecutor Chou-Chou Collins took Jenson through how Hughes had been an aloof “mystery man” on the second of two trips Shurtleff and Swallow made to Pelican Hills, where Jenson stayed with his family for close to a year. Jenson said that, along with Hughes and Reid, UTA attorney Bruce Jones had attended a meeting at Jenson’s office that he was excluded from. At one point on the second visit, Jenson recalled how Shurtleff asked for a favor. The then-sitting AG believed that Utah United States Attorney Brett Tolman was coming after him with charges. Jenson said his associate Paul Nelson brokered a sit-down with Tolman that led an elated Shurtleff to promise Jenson that the state would be done with him in regards to his plea in abeyance and restitution from a 2005 securities fraud case. Jenson alleged Swallow squeezed him for a third trip to Pelican just for he and his wife for their upcoming anniversary. Jenson acquiesced to Swallow’s request because at every turn Swallow would tell him he was Shurtleff’s heir apparent. “You’re going to need me” was Swallow's mantra to Jenson, the latter insisted. The composed Jenson broke down as he recalled his attorney Greg Skordas telling him in court not to worry as a bailiff took him into custody after a judge revoked his plea in abeyance. “That’s a jail behind that door,” Jenson told the jury shortly before lunch, pointing to a door in the courtroom. Once booked into the county lock-up, he was then informed he could not make bail as he had new charges, relating to his Mount Holly development. He spent 50 months behind bars of a 10-year sentence on his 2005 case. Defense Attorney Scott Williams questions Marc Sessions Jenson. After the quieter tones of Collins, defense attorney Williams’ voice rang to the white rafters. Williams cross-examined Jenson on his prior testimony where the businessman had alleged a $35 million “kickback fraud” around Whitewater VII/UTA Draper stop development. He mimed back to him how Jenson had held his hands together closely at six inches to identify of how little significance what Shurtleff and Swallow gained from the two weekends in Pelican Hills was compared to the three-foot significance that was the Draper property scheme Jenson alleged was at play. Jenson, however, seemed reticent to revisit those allegations. He said no to Williams’ question if in the prior week he’d been asked to not address the $35 million scheme he had so floridly brought to live in court a week before. 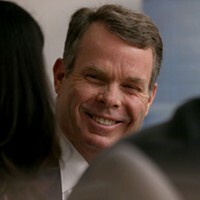 Williams nevertheless took him through more details of his allegations, including that he’d told Davis County prosecutor Troy Rawlings that the LDS church and top church official David Burton were also involved in the scheme. After the rather dry morning, the proceedings livened up in the afternoon as Williams, ever the master of the dry double-take and verbal skewer, found a profitable vein to mine when it came to how much money Jenson had at the time he agreed to pay victims of his securities fraud $4.1 million in restitution. Jenson told the jury with a friendly smile that he had a $22 million-valued art collection, $300,000 in watches and $8 million in various homes on the Wasatch Front. Jenson said he had borrowed against many of these assets, but nevertheless had sufficient access to funds to afford to live first at Laguna Beach for six months and then nearly a year at Pelican Hill—combined rental costs of close to $1.5 million. 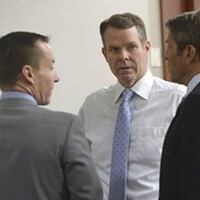 Williams showed the court the docket relating to the plea in abeyance that Jenson said Shurtleff, Lawson and Swallow had held over his head for several years, extorting him financially. Part of the plea deal was that the three-year time frame for which to pay back the money he owed investors could be cut in half to 18 months if all terms were met, including giving back that $4.1 million. “Instead, you maintained the circumstances where you were being extorted weekly by Timothy Lawson and Mark Shurtleff,” Williams said. “I was following instructions,” Jenson replied. Williams took Jenson through texts between he and Shurtleff that showed, despite Jenson’s claim, that his lawyers had opposed his initial attempt to “friend” the AG, his attorney Greg Skordas had signed off on it in a text. Williams also got Jenson to agree he’d never paid a dollar to Swallow. Williams then brought up the issue of Swallow asking Jenson for a $1.5 million Mount Holly lot at the Beaver, Utah, resort-development Jenson was linked to. Jenson confirmed that such an arrangement existed on paper and his brother, Steve, would have it. However, he had not spoken to his brother since 2011. Had he asked his brother for the paperwork, Williams asked? “Never have,” Jenson replied. The day had its moments of levity, notably prosecutor Fred Burmeister complaining to the judge about Shurtleff responding to The Salt Lake Tribune reporter Jennifer Dobner’s tweets. Williams, Burmeister and the judge then got into a slightly confused conversation about who had ordered what in terms of limiting witnesses sitting outside the courtroom from reading Twitter feeds, when the court had evoked the exclusionary rule, which meant to bar them from court proceedings. Williams opined that technology had got ahead of the law somewhat when it came to addressing such knotty issues. Judge rules former AG is entitled to $1.58 million legal fees reimbursement. Already imprisoned Jeremy Johnson gets 30 days.